PlaceholderLeftActions – what is it? I’ve been doing some branding for the last week or so, and today was the turn of the left nav menu. I’ve gotta admit, I don’t like doing this – it’s complex, fiddly, and leaves me with what I call “SharePoint Branding Tourettes”. While going through the code for the left side of the page, I came across the PlaceHolderLeftActions placeholder. By default, it’s empty. 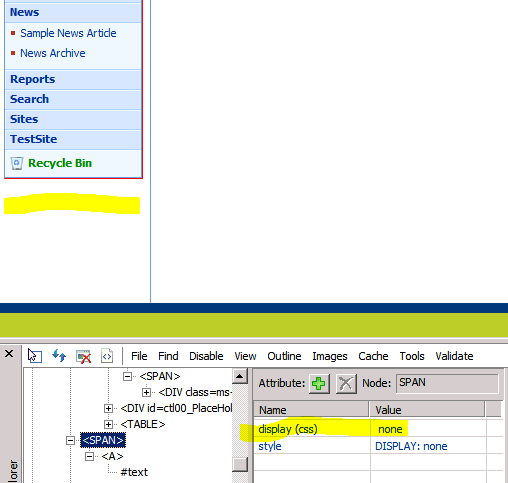 I’ve highlighted where the content goes, and you can see from the IE dev bar, there is a hidden link there (to the List Settings page, if you’re interested). 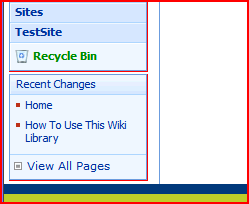 I guess the real annoyance here is that it is so hard to see what pages in SharePoint use what placeholders. It’s not like you can just search over the file system, even. I guess it’s a matter for experience. Anybody else know what the PlaceHolderLeftActions is used for? I might try and build up a library. one more use of this placeholder is for image thumbnail on picture library. without this placeholder, your image thumbnail will not show.